Sycamore Cottage at Thirley Cotes Farm Cottages in Harwood Dale, near Scarborough, Yorkshire sleeps 10 people. 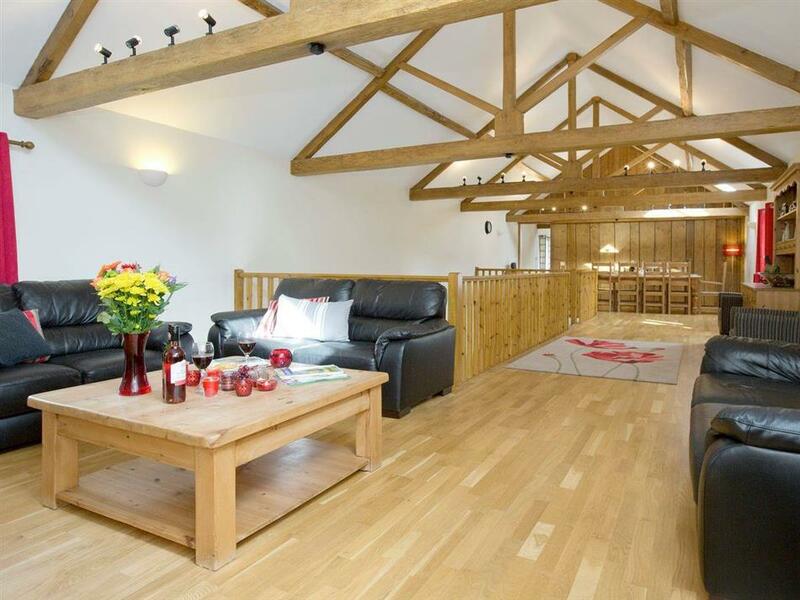 Sycamore Cottage is a terraced barn conversion and was formerly the thrashing barn and grain store. It offers ’upside down’ accommodation with the bedrooms on the ground floor, and the open plan living space upstairs. In the grounds at Thirley Cotes Farm Cottages near Scarborough there is a play area with swings and slide for under 12 year olds who must be supervised. Set in the heart of the North York Moors National Park, Thirley Cotes Farm is a Grade ll listed farm dating back to around 1830. However, earlier records show Thirley Cotes mentioned in the Doomsday Book. The main house is set in a courtyard setting of outbuildings, all converted into a wonderful development of holiday cottages. Original features have been retained where possible, and the original trusses bear Roman numerals carved into the wood depicting the year they were constructed. The name Thirley Cote Farm Cottages was decided on due to the stunning woodland views with endless walks and cycle tracks between Broxa Forest and Harwood Dale Forest. There are many activities and attractions in the area to keep all the family entertained. Dalby Forest has world cup mountain bike trails, Go Ape tree adventure, and nature walks. The RSPB reserve at Bempton Cliffs is worth a visit, and is home to thousands of sea birds nesting precariously on the cliff face. Keen birdwatchers can see kittiwakes, gannets and puffins, and offshore porpoises and grey seals can be spotted. Traditional seaside resorts can easily be reached including Whitby, famous for its fish and chips and cliff top abbey ruins, and all the fun of the fair at Scarborough with two wide sweeping beaches, amusements and cliff top castle. Also worth a visit are the quaint fishing villages of Robin Hood’s Bay, Staithes and Runswick Bay. Further inland, the medieval city of York can be reached within an hour, with its Roman city walls and towering minster. Why not take a nostalgic journey on a steam train through the North York Moors from Whitby to Pickering, calling at Goathland, made famous as Aidensfield in the TV series ‘Heartbeat’? Organised walks, cycle days and nature tours can all be arranged locally, and there is a selection of bikes for visitors to use, subject to availability. The beach is 4 miles from Thirley Cotes Farm Cottages near Scarborough, with the shop 3 miles, and the pub & restaurant 1½ miles. Sycamore Cottage can be booked together with Holly Cottage (ref UK2235 [Holly Cottage]), Thirley Cotes Farmhouse (ref UK2237 [Thirley Cotes Farmhouse]), Oak Cottage (ref UK2238 [Oak Cottage]) and Willow Cottage (ref UK2239 [Willow Cottage]) to sleep up to 28 people. Ground Floor at Sycamore Cottage: Bedroom 1: With double bed and en-suite with shower cubicle and toilet. First Floor: Living/dining room: With 42 Freesat TV, DVD player, Blu-ray player, iPod dock, CD player, beams and wooden floor. Kitchen: With electric range, combi microwave/oven/grill, fridge/freezer, dishwasher, washing machine, beams and wooden floor. Air source underfloor central heating, electricity, bed linen, towels and Wi-Fi included. Travel cot, highchair and stairgate available on request. Welcome pack. External games room with pool table, table hockey and table tennis (shared with other cottages). External utility with additional freezer space (shared with other cottages). 4-acre woodland. Grounds with children’s play area, patio, garden furniture and barbeque (shared with other cottages). Lawned area with hot tub for 6 (shared with other cottages, time restrictions apply, over 16 year olds only). Bike store. Private parking for 1 car. No smoking. Please note: There is an unfenced stream in the woodland. There is a fenced pond in the grounds, 500 yards. Holidays at Sycamore Cottage, Thirley Cotes Farm Cottages run from Friday to Friday. Pets allowed at Thirley Cotes Farm Cottages - Sycamore Cottage. For a better idea of where Thirley Cotes Farm Cottages - Sycamore Cottage is, you can see Thirley Cotes Farm Cottages - Sycamore Cottage on the map below. You can find more large holiday cottages (that's cottages which sleep 8 or more people) in North Yorkshire. If you want to see more large cottages, have a look at large cottages in North Yorkshire. 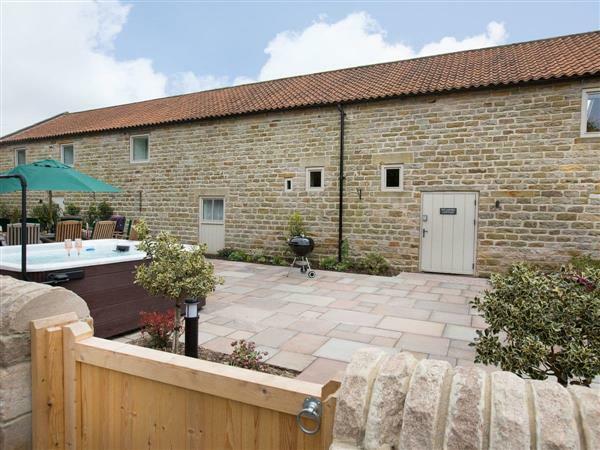 Thirley Cotes Farm Cottages - Sycamore Cottage is in North Yorkshire; should you be on the lookout for a special offer, you can find all the special offers in North Yorkshire. It's always worth checking to see what is on offer at the moment. Do you want to holiday near Thirley Cotes Farm Cottages - Sycamore Cottage (UK2236), you can see other cottages within 25 miles of Thirley Cotes Farm Cottages - Sycamore Cottage; have a look to find your perfect holiday location.